S-9.Nuclear Weapons The Sun is the source of most of the energy on Earth--the power source for plants, the cause of flows of atmosphere and of water, the source of the warmth which makes life possible. None would exist without it. At the Earth's orbit, neglecting absorption by the atmosphere, each square meter of area facing the Sun receives about 1380 joules per second (nearly 2 horsepower). That quantity is known as the solar constant and sensors aboard NASA's satellites over the 1979-99 interval suggest it varied by only about 0.2%. See graph here . But what powers the Sun itself? How much longer will it shine, before its fuel runs out? For how long has it given out its energy? The first to consider these questions seriously was the great German physicist Hermann von Helmholtz, who noted in 1854 that the Sun's own gravity could supply an appreciable amount of energy. If the Sun were gradually shrinking--if all its matter was gradually falling towards its center--enough energy could be released to keep it radiating for a fairly long time. He calculated that this source could provide the Sun's energy for times of the order of up to 20 million years. Then radioactivity was discovered, the decay of heavy elements into lighter ones through the emission of fast particles, containing a great deal of energy. As it turned out, it was this energy, from radioactive elements in rocks, that provided the internal heat of the Earth. Radioactivity also allowed new estimates of the age of the Earth, since the amount of accumulated decay products in ores indicated how long the process had been going on. This suggested the Earth was much older than Helmholtz'es estimate, perhaps billions of years old. Could perhaps the new source of internal energy also supply the Sun's needs for such a long time? Gradually the picture became clearer. Atoms were found to consist of heavy nuclei, consisting of electrically positive protons and uncharged neutrons, while around the nuclei swarmed lightweight electrons, with a negative electric charge. An electron has about 1/1840 the mass of the proton, which is also the nucleus of hydrogen. Electrons and nuclei were kept together by electric attraction (negative attracts positive). Furthermore, electrons were sometimes shared by neighboring atoms or transferred to them (by processes of quantum physics), and this link between atoms gave our world its many chemical compounds. But something else was needed to hold nuclei together, since all protons carried positive charges and repelled each other. Electric forces are definitely not the glue that holds nuclei together, they act in the wrong direction! Besides, binding neutrons to nuclei clearly requires a non-electrical attraction. All that suggested a different kind of force, a nuclear force, was holding nuclei together. That force had to be stronger than the electric repulsion at short distances, but weaker far away, or else different nuclei might have tended to clump together, too. In other words, it had to be a short-range force, like the force between two small magnets--very hard to separate when stuck together, but once pulled a short distance apart, the force between them drops almost to zero (do not take this analogy too literally!). Actually two kinds of force are active in the nucleus, known simply as the "strong nuclear force" and the "weak nuclear force," or else the "strong interaction" and the "weak interaction" (because their main effect is in converting and creating particles). The weak interaction also affects electrons and other particles, but in the nucleus its main role is to maintain a balance between protons and neutrons, which except for their electric charge are very similar particles (diferent kinds of "nucleons"). Nuclear structure (in light nuclei, at least) favors nuclei containing equal numbers of protons and neutrons, and although moderate inequalities can also exist (in "isotopes"), when they get too big, the weak interaction can convert nucleons of one kind to the other, emitting an electron (or a positron, its positive counterpart) in the process. That is known as beta radioactivity and will not be discussed any further. The strong nuclear force (the only nuclear force considered from here on) can bind protons and neutrons into bigger nuclei. Being positively charged, all these nuclei repel each other, and therefore, except in the presence of extreme temperatures and pressures--such as exist in the core of the Sun--two different nuclei are not likely to combine into one. Their electric repulsion does not allow them to get close enough for the nuclear force to take over. Nature contains nuclei of many different sizes. In hydrogen they contain just one proton, in heavy hydrogen ("deuterium") a proton and a neutron; in helium, two protons and two neutrons, and in carbon, nitrogen and oxygen--6, 7 and 8 of each particle, respectively. The masses of all these nuclei have been measured, and an interesting fact was noted: a helium nucleus is lighter than the sum of the weights of its components. The same held even more for carbon, nitrogen and oxygen--the carbon nucleus, for instance, was found to be slightly lighter than the combined mass of 6 protons and 6 neutrons. The reason for this "mass defect" has to do with Einstein's famous formula E=mc2, expressing the equivalence of energy and mass. By this formula, adding energy also increases mass (both weight and inertia), removing energy, decreases it. If a combination of particles contains extra energy--for instance, in a molecule of the explosive TNT--weighing it will reveal some extra mass (compared to its end products--an unmeasurably small difference, for TNT). If on the other time we need invest energy to separate it into its components, the weight will be less than that of the components. The latter is the case with nuclei such as helium: to break them up into protons and neutrons, we would have to invest energy. On the other hand, if a process existed going in the opposite direction, by which hydrogen atoms could be combined to form helium, a lot of energy would be released-- namely, ΔE=Δm c2 per nucleus, where Δm is the difference between the mass of the helium nucleus and the mass of four protons (plus 2 electrons, absorbed to create the neutrons of helium). As we go on to elements heavier than oxygen, the energy which can be gained by assembling them from lighter elements decreases, up to iron [more precisely, a low-abundance isotope of nickel marks the peak]. For nuclei heavier than iron, one actually gains energy by breaking them up into 2 fragments. That, of course, is how energy is extracted by breaking up uranium nuclei in nuclear power reactors. The reason the trend reverses after iron is the growing positive charge of the nuclei. The electric force may be weaker than the nuclear force, but its range is greater: in an iron nucleus, each proton repels 25 other protons, while (one may argue) the nuclear force only binds close neighbors. As nuclei grow bigger still, this disruptive effect becomes steadily more significant. By the time uranium is reached (92 protons), nuclei can no longer acommodate their large positive charge, but emit their excess protons in the process of alpha radioactivity--the emission of helium nuclei, each containing two protons and two neutrons. (Helium nuclei are an especially stable combination.) Still heavier nuclei are not found naturally on Earth. It is believed that the Sun is about 5 billion years old, formed when gravity pulled together a vast cloud of gas and dust, from which the Earth and other planets also arose. The gravitational pull released energy and heated the early Sun, much in the way Helmholtz had proposed. Heat is the motion of atoms and molecules: the higher the temperature, the greater their velocity and the more violent are their collisions. When the temperature at the center of the newly-formed Sun became great enough for collisions between nuclei to overcome their electric repulsion, nuclei began to stick together and protons were combined into helium, with some protons changing in the process to neutrons (plus positrons, positive electrons, which combine with electrons and are destroyed). This released nuclear energy and kept up the high temperature of the Sun's core, and the heat also kept the gas pressure high, keeping the Sun puffed up and stopping gravity from pulling it together any more. That, in greatly simplified terms, is the "nuclear fusion" process which still takes place inside the Sun. Different nuclear reactions may predominate at different stages of the Sun's existence, including the carbon-nitrogen cycle which involves heavier nuclei, but whose final product is still the combination of protons to form helium. A branch of physics, the study of "controlled nuclear fusion," has tried since the 1950s to derive useful power from "nuclear fusion" reactions which combine small nuclei into bigger ones--power to heat boilers, whose steam could turn turbines and produce electricity. Unfortunately, no earthly laboratory can match one feature of the solar powerhouse--the great mass of the Sun, whose weight keeps the hot plasma compressed and confines the "nuclear furnace" to the Sun's core. Instead, physicists use strong magnetic fields to confine the plasma, and for fuel they use heavy forms of hydrogen, which "burn" more easily. So far, no success--magnetic traps are rather unstable, and any plasma hot enough and dense enough to undergo nuclear fusion tends to slip out of them after a short time. Even with ingenious tricks, the confinement in most cases lasts only a small fraction of a second. The Sun today still consists mostly of hydrogen. The fuel supply which has seen it through its first 5 billion years should be good for about as long in the future. Apart from the planets, almost every star we see at night is a sun: some are bigger than ours, some smaller, some are at an earlier stage of their developments, some at a later one, and some have evolved altogether differently, for a variety of reasons. The telescope allows astronomers to observe and compare stars of different size, at different stages of evolution. Their smooth spectra tell about their temperatures, their spectral lines reveal some of their composition, and based on these, a general theory of "stellar evolution" has been formulated, which also applies to our own Sun, a typical "main sequence" star. Small stars last longer and many are dim; but whatever a star's size, ultimately it runs out of hydrogen. It can still release energy by "burning" heavier nuclei and combining them into bigger ones, up to iron: theory suggests this does happen, but it provides much less energy and does not greatly extend the star's lifetime. When all the fuel is gone, gravity again becomes the dominant source of energy, and the star again begins collapsing inwards. The Earth keeps its size because its gravity is not strong enough to crush the minerals of which it consists. Not so with a star massive enough to sustain nuclear burning. A small star may crush all its atoms together, creating a "white dwarf"--e.g. of half the mass of the Sun, but only as big as the Earth. Some energy release continues (hence "white") but ultimately, the star probably becomes a dark cinder. This may be the fate of our Sun, too. In the final transition strange changes occur--the star becomes a "red giant," diffuse and enormously large, and later much of the material is blown to space where it forms a "planetary" nebula, but there is no explosion. See "The Complexity of Stellar Death" by Yervant Terzian, "Science" vol. 256 p. 425-6, 15 October 1999. Stars several times the size of our Sun have enough gravity to crush together not just atoms but even nuclei, compressing all their matter to a sphere perhaps 15 kilometers across. After their collapse they become "neutron stars" consisting only of neutrons (the protons all switching form), giant nuclei as dense as the ones in atoms. A huge amount of energy is liberated in that final collapse which is quite rapid, blowing off the top layers of the collapsing star and also producing elements heavier than iron. That catastrophic event is known as a supernova explosion (technically, a "type 2 supernova"). Tycho Brahe was fortunate to have seen one that occured in our galaxy, outshining Venus and visible even in the daytime. The Chinese observed one in the year 1054, in the Crab constellation of the zodiac, and still another occured in Kepler's lifetime. Since then, however, none seemed to have occured close to Earth. The most notable event of this type was observed (quite extensively) in 1987 in the Large Magellanic Cloud, a small galaxy neighboring ours (see image above; the inner cloud is the one produced in the explosion, the rings seem older). The material blown off by a supernova explosion ultimately scatters throughout space, and some of it is incorporated in clouds of dust and gas which later form new suns and planets. Almost all elements on Earth that are heavier than helium (except, possibly, a small amount of lithium) must have arrived that way: products of nuclear burning in some pre-solar star, released or created in the explosion accompanying its final collapse. Our bodies are made of star stuff--carbon, oxygen, nitrogen and the rest have all been produced by nuclear fusion. As for the "supernova remnant" left over from the collapse, its fate depends on its mass. If the star was not too massive, the remnant (as explained) is a neutron star. It that star originally rotated around its axis, that rotation is enormously speeded up; the remnant of the supernova of the year 1054 (its ejected cloud, the "Crab Nebula," is shown on the left) is spinning at about 30 revolutions per second! Any magnetic field of the original star is also enormously amplified, and associated phenomena can make it beam radio waves. Pulsars, pulsed radio sources with remarkably stable pulsation periods (associated with their rotation) are produced that way. By the way, the Crab Nebula is still expanding; see here for a comparison of two images, taken 30 years apart. Another image of the nebula, highly detailed, is given here. 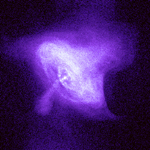 Added 20 October 1999: The new Chandra orbiting X-ray telescope has taken a high-resolution picture in X-rays of the central region of the Crab nebula. Before this, astrophysicists guessed the remnant star might be surrounded by orbiting debris, with high-energy particles shooting out along its magnetic axis, the one direction in which magnetic field lines do not confine them. The picture on the right suggests something like that might indeed be happening. For the image of a supernova remnant in Centaurus, as seen by Chandra, see here. Theory suggests that a star much more massive than the Sun will collapse even further and become a black hole. What happens then can only be guessed and calculated, not observed, for the star's gravity in the collapsed state is so strong that no light and no information can return from it to the outside world. One therefore expects such objects to be completely black (Except for light from matter falling into them! ); they are called "black holes" because the general theory of relativity suggests that the matter in such a star keeps falling indefinitely, as the star contracts to a point. Thus in theory such stars are like the proverbial bottomless pit, although no observation could ever confirm it. Although astronomers cannot see such objects, they have considerable evidence that they exist, at least in a number of locations. For some time now it was believed that very massive black hole existed at the center of our galaxy, and if so, probably also at the centers of other galaxies, helping hold them together. We now have some pretty definite proof, and also a good estimate of what the mass of that monstrous object may be. The story of that discovery is given in the following section, "The black hole at the center of our galaxy". It has a lovely taste! *** What keeps the Sun from blowing up? *** Question concerned with teaching about nuclear fusion. *** What is the nearest star outside our galaxy?. *** What is gravitational collapse?. *** How were planets created? *** What makes the sun shine so brightly? *** "How often are stars born?" *** What is the fate of starlight energy? *** Why are nights dark? *** Does iron Fe56 have the most stable nucleus? For section "The Black Hole at the Center of our Galaxy" mentioned above, click here.